Sir Anthony Seldon, head of the National Archives, came with some extraordinary documents, set to tour the country, to Downing Street. 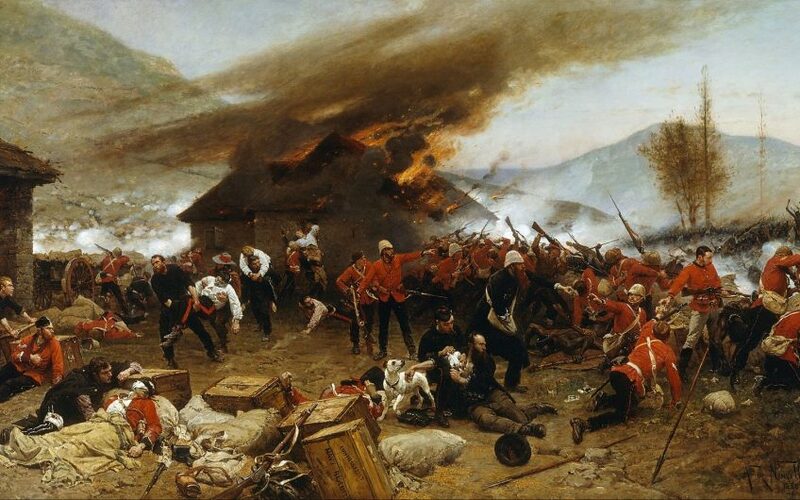 Along with Henry VIII's will and the funeral arrangements for Lord Nelson, those documents included an account of the battle of Rorke's Drift, written by the man who led its defence, Lt. John Chard. In other news, James Rebank, a shepherd and autobiographer, said he learnt the entire script of the film Zulu as a child, down to what Michael Caine said when the Zulus came over the hill. Last year, 28 people sent a letter of complaint to the Mayor of Folkestone, protesting at the screening of the epic war film Zulu – the film that brought Michael Caine to stardom – which was shown at Folkestone’s Silver Screen Cinema to raise funds for the Armed Forces charity. The film was criticised because it was laden with ‘racist overtones,’ ‘historical inaccuracies’ and a false narrative of ‘honour, courage and pride’, which inflates the importance of an otherwise insignificant battle, particularly when compared with the humiliation at the Battle of Isandlwana where 1,300 British soldiers were wiped out by the Zulus’ main impi. Oh dear. Where to even begin...? As a 23-year-old I should be totally appalled by Zulu. In fact, I love it. Zulu is a classic, one of the best war films of all time and demonstrably forward-thinking. It begs the question, when will this censorship fad end? When all war films are banned? When all films referencing the empire are removed from our screens? As far as I am concerned, the criticisms levelled at the film are unfounded, and I fail to see how a movie with so many anti-imperial overtones has come under attack from anti-racists. The critics have come to bury what they should have come to praise. The film may end on the note of the eleven Victoria Cross winners, but honour, courage and pride do not really match the overall message of the film. The arrogance of Michael Caine’s character – Lt Bromhead – shown so brashly at the beginning of the film is all but destroyed by the end. In one of the final scenes, he and Stanley Baker’s Lt Chard discuss the sickness, shame and disgust they feel as a result of their first experience in the ‘butcher’s yard’. Incidentally, both these men died young – broken men. Throughout the whole film, anyone harbouring racist beliefs, or contempt for the Zulus, is proved completely wrong. The Zulus are shown to be an immensely disciplined, tactically competent and brave fighting force. The critics clearly haven’t done their research. Cy Endfield the director – who was blacklisted by Hollywood for holding communist beliefs – consistently critiques this contempt for the Zulus. In Zulu Dawn, released in 1979, the arrogance and naivete of Lord Chelmsford is portrayed as being the principal reason for the defeat of the British at Isandlwana. The message of both films is identical, the only difference is that the British lose in one and not the other. It is true that the film was staggeringly innaccurate. I mean, really, portraying the teetotal model soldier – Henry Hook – as a coward and a thief, how unfair. Incidentally, it prompted his two daughters who saw the film on its release to leave the cinema in disgust. But when it comes to war films, there are many greater offenders. The omission of the killing of wounded Zulus after the battle was – granted – an inaccuracy. Instead, the battle is ended with both sides – as it were – leaving the field as equals. Is that not the antithesis of racism? The critics seem to wish it had been more racist, as Zulu did not portray the British forces – and by extension the empire – in a bad enough light. Honouring an heroic military action and honouring the British empire are two different things. And it is lazy thinking to suggest that the film does both. The empire is gone, elements may yet linger, but banning films that were remarkably progressive for their time will not breakdown the remnants.